Stop Fighting Fires - Prevent Them Instead!Eliminate The Muda! Stop Fighting Fires - Prevent Them Instead! It is almost a badge of honor that you have fought the same problem before. You might even be the resident expert at fighting fires. In a work environment it may be a process that seems to fail on a daily basis or a piece of equipment that just needs another swift kick here or whack there. As consumers we have all had an employee quietly telling us how some “problem” happens frequently (why do they tell us this stuff?). In our personal lives many of us fight fires as well. I recall a family car with a bad starter relay. My Father ran a jump wire and each time it acted up we had to open the hood and touch the wire to a bolt on the engine to start the car. We did this for what seemed like years! For over a year, my wife complained about the slow boot process of our computer. It took a virus infection and the need to reimage the hard drive to get a speedy start-up. The fires we fight everyday can be varied: it may be a temperamental kitchen appliance, a rift in a relationship with our spouse or running out of money before we run out of expenses as we live from paycheck to paycheck. And then, in a matter of days or weeks we find ourselves dealing with the same problem all over again! My theory is that our Western culture breeds this approach of accepting the status quo. Our kids learn at a young age to “tow the line”, and “not rock the boat”, they are not suppose to question authority. Recently I visited my daughter’s public elementary school to each lunch with her. All children had to walk in single file fashion through the halls on the “second tile” from the wall. In the lunch room they follow a cycle where they are only allowed to talk for 6 minutes and then classical music is played for 6 minutes during which time they must all remain silent while eating. Our kids grow up and enter the work world. In most companies there is an obvious chain of command. Corporate management structures continue to be mirrored on the militaries command and control structure that has been refined since the time of the Romans. Employees are often directed by their supervisors to “do as they are told”, “keep their nose to the grindstone” and again are admonished to not question authority. We are taught to hide problems for fear of repercussions. Our little problems fester and grow until such time as we can no longer ignore them. 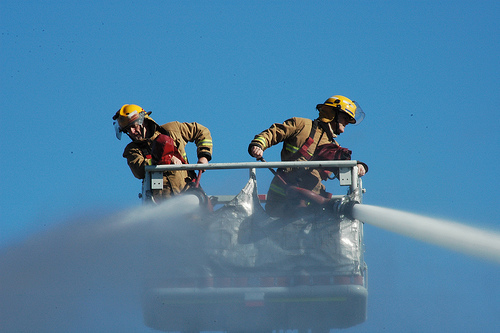 Then we are incentivized and even recognized when we successfully “put the fire out.” At this stage somebody, often the manager, steps in to save the day. The issues are overcome as the fire is put out, but the root cause of the issue often is not addressed. Another quote I consider every time I open my laptop is from a fortune cookie. It’s taped above my screen. It says “Of all our human resources, the most precious is the desire to improve.” We are presented with opportunities to improve every time we encounter a “fire.” It is time we stop fighting these fires and start preventing fires. You can start with just one question, the next time you encounter a problem please just stop for a moment and ask yourself “How can I prevent this from happening again?” If you can answer this question then you are on your path to preventing fires instead of fighting fires.